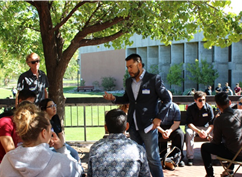 UNM Law School alum Preston Sanchez, who co-directs the UNM chapter of the Marshall-Brennan Project, outlines a Constitution Day activity to a group of high school students. The UNM chapter of the Marshall-Brennan Project, co-directed by UNM Law School alumni Preston Sanchez and Matt Bernstein, has organized a celebration at the law school for the past three years that brings public high school students to the law school to learn more about the U.S. Constitution and life as a law student. 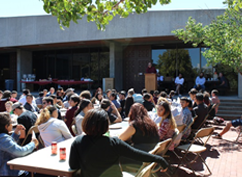 This year, 70 high school students from Valley, West Mesa, Highland, Amy Biehl, and ACE Leadership Academy attended the law school’s Constitution Day. Besides engaging activities and tours of the school, students heard from the featured guest and renowned poet Jimmy Santiago Baca. 2016 Constitution Day included a tour of the law school, a variety of activities, lunch and speakers. Baca spoke about overcoming barriers of success and the vital importance of a legal education for marginalized communities to succeed in today’s society. Luncheon speakers included Assistant Professor Maryam Ahranjani , who directed the law school’s Marshall-Brennan Constitutional Literacy Project chapter in 2014. Prior to UNM, Ahranjani taught as an adjunct professor at American University Washington College of Law (WCL) for eleven years and served as the Associate Director of the Marshall-Brennan Program Constitutional Literacy Project for five years. Ahranjani joined the UNM Law School faculty this fall and is co-author of the textbook Youth Justice in America (2nd edition, 2014). 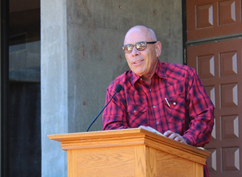 Renowned poet Jimmy Santiago Baca shared insights from his life and encouraged students to embrace their right to vote. Constitution Day celebrates the work of our country’s Founding Fathers when on Sept. 17, 1787, the delegates to the Constitutional Convention met for the last time to sign the document they had created. When Constitution Day falls on a weekend or on another holiday, schools and other institutions observe the holiday on an adjacent weekday. This year, Constitution Day was celebrated on Sept. 16. The Marshall-Brennan Constitutional Literacy Project, which began at American University Washington College of Law in 1999 and has existed here at UNM since 2011, has been officially celebrating Constitution Day since 2005, when Congress passed an appropriations bill that included a provision requiring that all educational institutions receiving federal funds to teach about the constitution that day. Click here to learn more about Constitution Day and the Marshall-Brennan Project’s work around it.